Well... 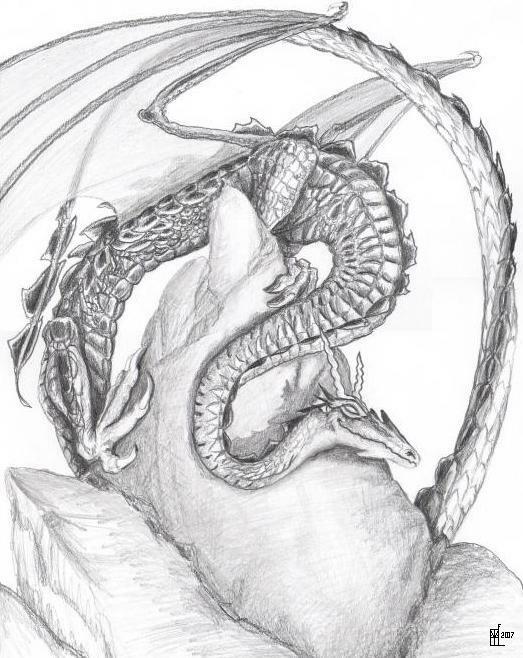 Although I'm not entirely satisfied with it, I think it is because I am so accustomed to drawing on paper 3 or 4 times bigger, I thought I would get this in for the Dragon Contest... Still doing the style with the slightly translucent wings. It has been a long... Looooong time since I did a pencil drawing. I would welcome constructive comments, if you have any to offer, as well as compliments. I would agree with you if you thought I might need more definition of the scales, but again... This might be something I could do if I drew larger and then had a digital camera instead of a scanner... Someday I'll do that! Shweetness. I can't draw dragons very well. I've been practicing, though. thats glorious! i wish i had the attention span to do that kind of work. Great detail to the scales and the rock. Hey thanks Doc! Nice of you to visit my gallery! Marvellous, I love the composition of the page! It's a great piece, I don't think you need more definition on the scales - I think it'd get too fussy and with dragons a lot of it is all about the dramatic lines of the body and not the tiny little things. The only thing I cold find to concrit on is the shadows - using a softer pencil on the really, really deep shadows (mainly the bits of the belly behind the fore and hind-legs) would bring a bit more depth. Also I couldn't place the light source exactly - I guessed top right and out of the page? If so would there be a band of shadow cast by the tail on the back wing? Just a nitpick though, it's just as good without it. Also, I <3 his smug little smile! Thanks! That's what I was shooting for.... I haven't seen you in a while! You must be busy! How can you not be satisfied with this beautiful piece of pencil work?! I adore the pic and love the dragon's cheeky grin. Do more dragon drawing, please!! Thank you so much for the nice comment... I most definitely will draw more dragons. LOL... Well, I don't HATE the picture, I just meant I'm more used to drawing them about 4 to 6 times bigger, and that way I have more detail... I just felt that it lacked some detail... Also I haven't drawn in pencil, except to sketch, for like about a decade... I forgot how soft the stupid 6B Pencils are... I had one about half the length of a regular pencil and now it's down to a nub... And it's nearly impossible to keep it nice and sharp for more than 2 seconds... LOL So, you see where I'm coming from? *nods* Hence, I only use 3B pencils. Last longer. I find that pencils like 6B and up are too soft for my type of drawing, and yes, I can relate to the constant sharpening of the pencil. I applaud the pencil detail artwork techniques applied and leave the criticism to others (I’m not here to nit-pick)! I know what I like and this is a nice piece! Thank you very much! You are very kind! I like your work as well! How long have YOU been drawing? well really its a meaningless gesture...it just cancels it self out..
Oh! *whew* what a relief! Then I'm not cursed and can go back to living my life! LOL Thanks for the compliment!